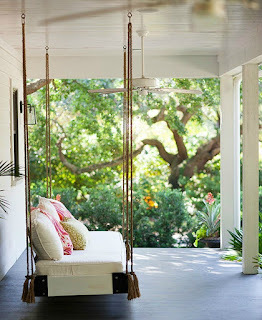 Although furniture is a quick fix, a swinging patio bed is a simple, charming DIY solution to relax-worthy seating. Adapt a platform or bench to hold a cushion and a back support. Hooks should be attached to beams, not the ceiling itself. 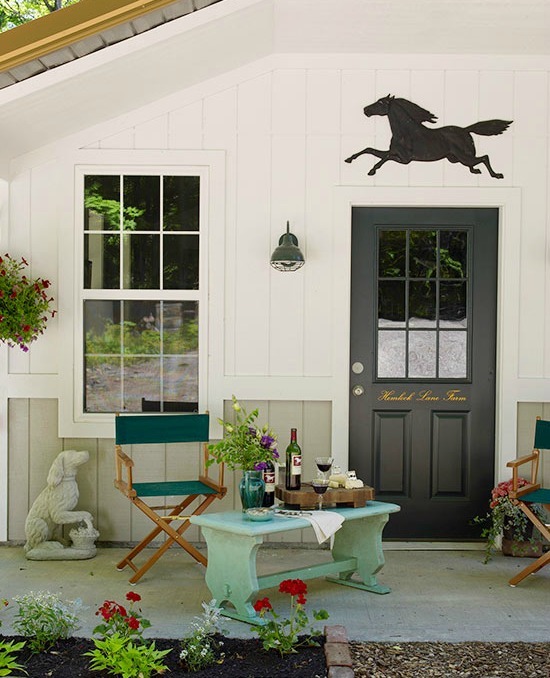 Convert underutilized areas in your landscape into welcoming patios by employing handsome furnishings, vibrant fabrics, and beautifully planted containers. 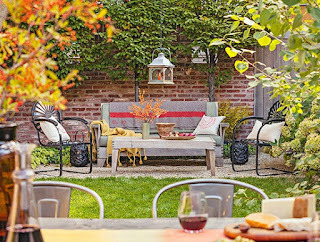 Though this area was designed as a designated patio space, patios can be located anywhere you can create a floor from brick, flagstones, wood chips, or gravel. 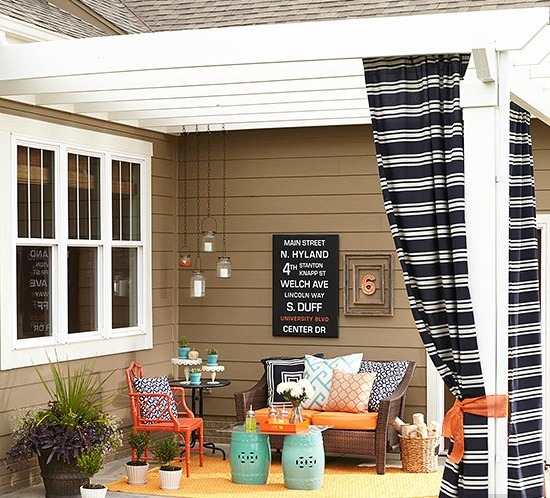 Consider furnishing your patio with lightweight pieces that you can move from sun to shade or partner with other conversation groupings as needed. 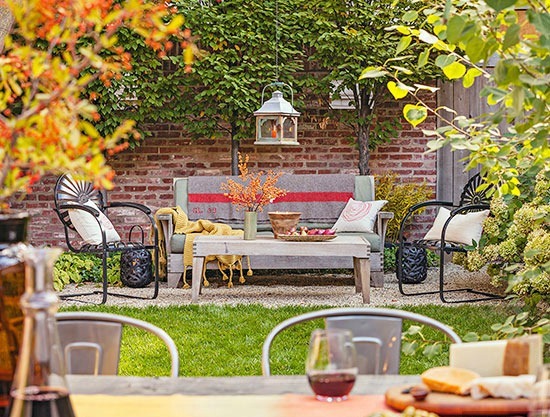 Look for pieces with vintage patinas, scintillating silhouettes, and chromatic fabrics so even the smallest objects will mightily contribute to a patio's overall good looks. 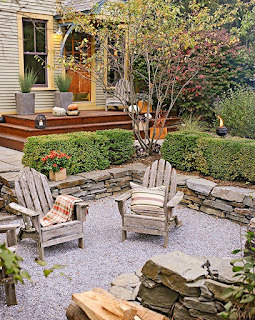 Gravel paths and flooring are a cost-effective and DIY-perfect patio idea to add hard surfaces underneath without much prep or upkeep. A border -- here, a loosely stacked stone edge that doubles as a bench -- helps keep the material in check. 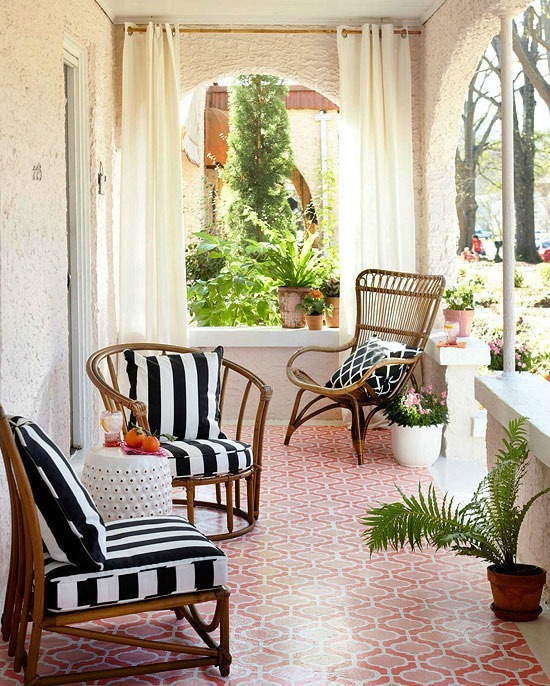 An intricate stencil can offer a patterned pop of color underfoot on an otherwise unadorned patio. For a detailed DIY creation such as this, consider a solid border -- here, several inches of off white -- to set off the floor. 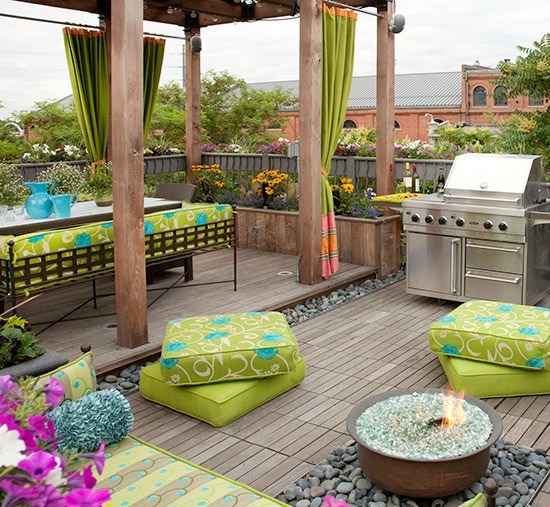 Many patios and outdoor spaces are a single material, which establishes design cohesiveness. But careful planning can add textural elements and visual relief. 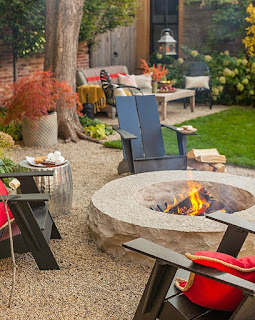 Here, the homeowner designated a narrow border and an inset to establish a cue between cooking and eating spaces, as well as to provide a space for the contemporary fire pit. 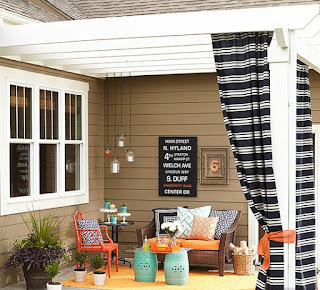 Even the simplest concrete slab can be a pretty design element with the right patio ideas. This little nook gets a big aesthetic boost thanks to a simply styled but elegantly detailed pergola. The structure abuts the house at the roofline for a seamless connection, with classically detailed columns that delineate the space's border (and provide a handy spot for some soft fabric shades, too). Many covered patios are wide open to the landscape, which establishes a connection to a yard. 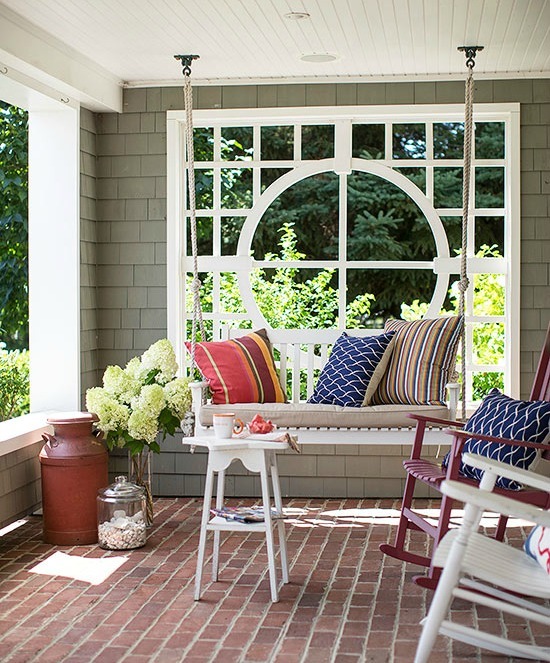 But if a little privacy would help enhance the space, consider this DIY idea: Add a trellis or other decorative structure to one of the openings. Here, the installation of a trellis window offers a backdrop for a conversation nook and a screening from the neighbors. 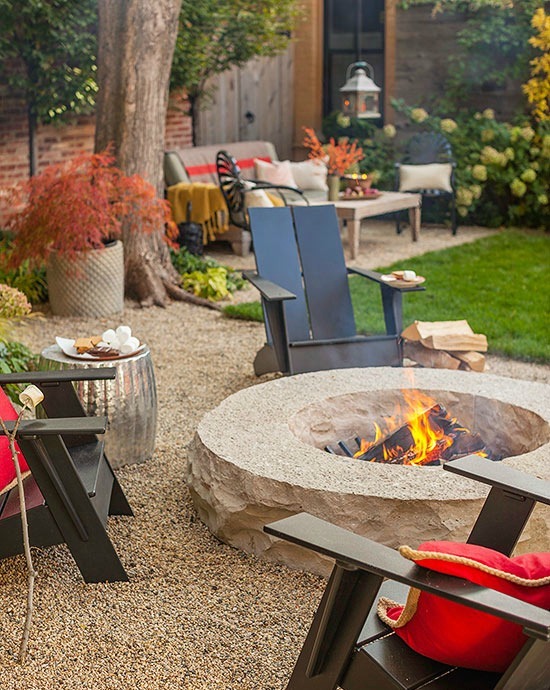 Loads of DIY options exist to add a fire pit to an outdoor patio space, including kits and simple how-tos. This element can help transition a gathering spot from warmer to cooler days and offer an extra surface that can be used as a serving or seating surface when unlit. 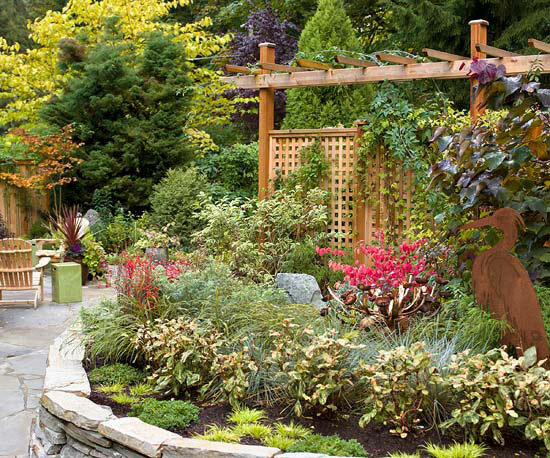 While containers are one way to include plants on a patio, another solution is to add permanent spots for flowers, vegetables, and dwarf trees. 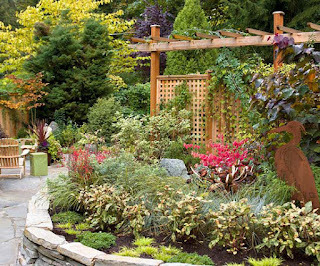 Consider raising the patio beds to offer screening and to lessen the effort of bending over to tend plants.